This is one of my favourite user stories of 2012. Back in September of last year, the delightful Gráinne (who I have had the pleasure of speaking to many times) decided she wanted to to organise a once in a lifetime surprise party for her husband, Andreas’, 50th birthday. Happily for us, she came across Shareagift online and used our site to crowd-fund the party, inviting his friends and family to contribute to one really special evening. Gráinne collected over €800 to her Shareagift Page, so she could organise a private ‘party bus‘ to take her, Andreas and 30 of their friends around the city. Collecting funds from friends around the world over several months, Gráinne kept the whole thing a secret from Andreas, so it was a total surprise when he arrived to find his name lit up in lights on the bus and all his friends there ready to celebrate with him. Gráinne surprises Andreas on the big day! 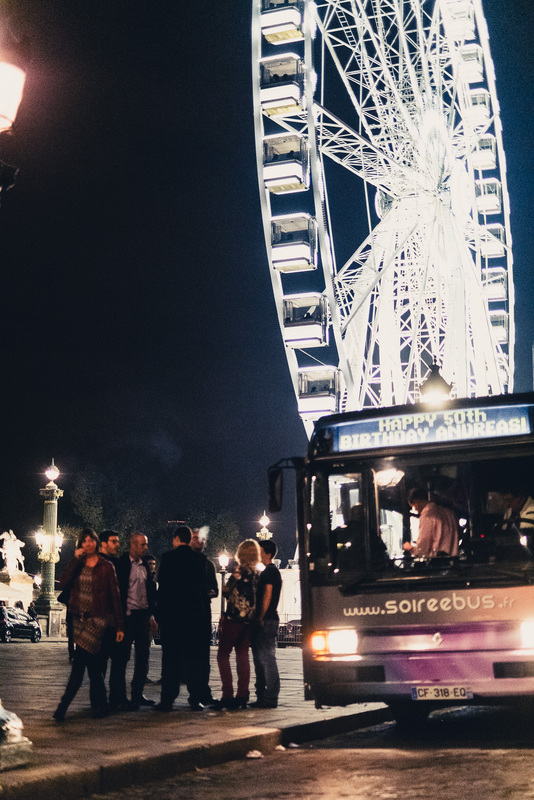 The Party Bus makes its way around Paris! We were all horribly jealous in the office to hear about their amazing adventure, but thrilled to have been able to help along the way. Gráinne, we’d like to take this opportunity to thank you so much for your time and your contributions – you gave us some awesome ideas and some invaluable feedback – and we’ve loved being in touch with you. And we hope Gráinne’s story will inspire a ton of other people to use Shareagift to crowd fund their parties and give other friends and family the evening of a lifetime.